Below are some helpful topics containing questions we are frequently asked. If you have a question which is not listed on this page, please speak with one of our Live Chat team or call 0330 333 2233. Creating an account couldn't be easier - see the Login or Register button in the top-right of the screen? Click on that and enter your details. You can sign into your account at any time - just click on the LOG IN button at the top of the screen and enter the email and password you used when you created your account, then click OK. Hey presto, you're in! No problem - it happens to us all. Click the LOG IN button at the top of the screen and you'll see a button that says Forgot Your Password. Click that. You'll need the email you used when you first created your account - enter this and click Recover Password. We'll send you an email with a link to reset - click it and follow the instructions. We'll have you back in your account in no time. Absolutely - once you've logged in, click on the Settings button and you'll be able to edit whatever you need. Just remember to save everything before you log out! How do I update my shipping and billing addresses prior to ordering? Yes, it's a good idea to keep your delivery and billing addresses up to date, as once you've ordered, we can only change them up to your dispatch date. Once you've logged in to your account, click on the My Address Book section and choose to edit or delete the existing addresses, or add in brand new ones. Remember to save your changes as you go! All of your invoices will be saved into your account online, so you can log in and down load them exactly when you need to. Log into your account locate your order and hover over the Cog (Top right hand corner) you should now see the option to View Invoice. To change your order, please speak with one of our Live Chat team or call us on 0330 333 2233 quoting your order number. If you have uploaded the wrong artwork, please speak with one of our Live Chat team or call 0330 333 2233 quoting your order number. Please note that because of our high-speed turnaround, your items will be printed soon after you place the initial order, however we will always do our best to change the artwork as late as possible. Log into your account locate your order and hover over the Cog (Top right hand corner) you should now see the option to change your delivery address. Please note that if this does not let you amend the details your order will have been despatched. Want to change the delivery address after dispatch? Sometimes, we're able to help with this, though it will delay your delivery by 24 hours. Get in touch on the details above and the team will try their best to help. And if you need to change your address for future orders? Simply add them to the address book in your account. You will be sent a tracking number by email when the order is dispatched. The email will include a link to the tracking area on UPS or DPD's website. The first thing to do is check the couriers website. It may be that they have tried to deliver your order and you were not in. They may have left your order in a safe place, or left it with a neighbour. The website will tell you in the tracking section what has happened to your order. If you are still unable to locate your order, please speak with one of our Live Chat team or call us on 0330 333 2233 and we will be happy to help. Please call 0330 333 2233 and ask to speak with one of our customer services team. Remember to have your order number to hand. Our customer services team may ask for pictures to get a better understanding of the issue. If you are unable to call or it is out of hours, then please use our contact form located on the “Speak To Us” page with as much detail as possible. Is it possible to leave feedback based on my experience ordering with WTTB? Alternatively, if you would prefer, you can send your feedback via live chat or out Contact Us page. Where can I find my dispatch date? The dispatch date can be found by logging into your account, selecting manage orders and clicking on your specific order. This will then show the estimated dispatch date. Our low prices are based upon the fact that payment is made with order. We may offer accounts subject to strict financial checks, although we would not consider an account status until you have had at least 6 months trading history with us and are projecting above the minimum required annual spend. Credit accounts are organised by special arrangement only. Please speak with one of our Live Chat team or our sales department on 0330 333 2233 for more information. Unless the customer selects to save their details, we do not store any credit or debit card details on our servers or databases. If you need any help as your file are larger, please speak with one of our Live Chat team or call 0330 333 2233. We would recommend WeTransfer or Dropbox as it is free to use and you can send files up to 2GB. All you need to do is enter the email address you need to send the artwork (if you have not been provided with an email address, please send to sales@wherethetradebuys.co.uk provide your address, select your file, add a message along with order number. We have two levels of artwork service: Just Print or File Check. We will automatically Just Print your Print Ready PDF as supplied. This service is free. For only £10 our expert artwork department will check all the artwork you upload to ensure you get the best result out of your print. Please note: This service is a technical file check. Please note that this is not a proofing service. Spelling, design and positioning are the responsibility of the client. We recommend that all artwork guidelines are followed as provided on the site. If you have used our Just Print service and your file has been rejected, you will need to re-submit your order following the instructions provided via email. Please note all artwork issues are corresponded through email so please make sure you check your inbox (or junk folders) to make sure your artwork has not been rejected. Alternately you can check your account to see the latest status of your order. We recommend using a program like Adobe Illustrator, creating a new layer called ' SCODIX' and indicating where you’d like it, using 100% Magenta Spot Colour to highlight the area. Alternatively, view our How To Guide. 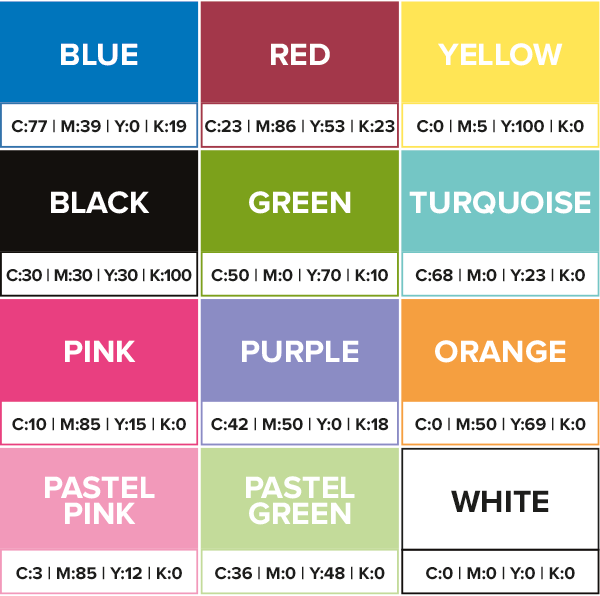 What are the CMYK values for your Lux card inners? Our website has a vast number of products available and we add new products on a regular basis. However, if there is something you need that isn't on our website, please request a quote on our speak to us page. I don't have print-ready artwork, what can I do? If you need help creating your artwork, we always recommend Tweak. Create print-ready artwork in minutes with handy templates. We offer FREE next working day delivery, this can take place anytime between 12pm - 7pm. We also offer Saturday deliveries and also pre-noon deliveries which are chargeable. For any address outside the UK please contact customer service on 0330 333 22 33. All our parcels are sent next working day. The usual more remote postcodes can take between 3-5 days. Throughout the order process we tell on what day you can expect your parcel to be dispatched. We currently dispatch 99.9% of orders on time. However, please remember that courier companies fail to deliver between 2-4% of parcels on time; we suggest using our Super-Fast Service if your order is time critical. If your files are rejected, or we fail to receive your artwork by the time stated on the product at the time of ordering, your dates may be moved on. You can be kept updated by logging into your account to see the production status. All production turnaround times are based on receiving print ready artwork on time. Will the products I have ordered arrive together? Different products have different turnarounds depending upon the complexity of production involved however these are all dispatched with the item that has the longest dispatch date. Should you need one of your orders sooner please contact customer service 0330 333 22 33 and they will try their best to amend the delivery. Will my customer know that I have used WTTB? No. We use unbranded packaging with no reference to Where The trade Buys. No invoices are ever included in the packaging. I sell my products onto re-sellers and don't want my company name as sender, can this be changed? Unfortunately, our couriers cannot do this at present.